Apprentices have been speaking about the valuable skills and experiences they have gained since joining a council’s workforce. Durham County Council offers apprenticeship opportunities across a range of areas, from civil engineering and business administration to accounting and catering. In September, 44 new apprentices will join the ranks, following in the footsteps of young people like Nathan Keogan, Jordan Clegg, and Lee Hibbitts who are all recent recruits and already working with the council’s Regeneration and Local Services directorate. Nathan, 21, from Consett, is undertaking a Level Three Advanced Apprenticeship in catering. Jordan, 19, from Ushaw Moor, is a waste operative and is enjoying his new role so much he hired a moped to ensure he can get to work. Lee Hibbitts, 21, from Bishop Auckland, is working as a HGV mechanic at the Peterlee depot. He said: “I like the responsibility of getting up and going somewhere to do something each morning and I like what I do. 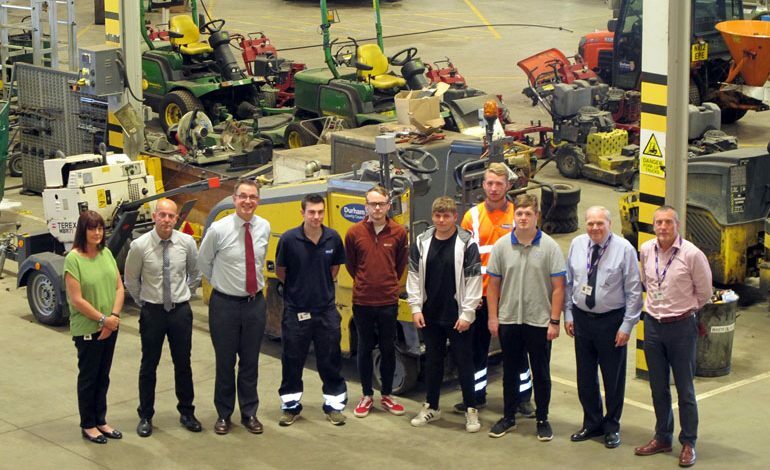 Oliver Sherratt, the council’s head of Direct Services, and Cllr Brian Stephens, Cabinet member for neighbourhoods and local services, spoke to the apprentices at a recent welcome event. Mr Sherratt said: “Durham County Council is an organisation with public service at its heart and this creates tremendous job satisfaction. “Furthermore, the diverse range of services that the council provides offers plenty of opportunities for apprentices to progress in a variety of professions, while working as a part of a strong team.